Do ahead: Place cinnamon candies into a plastic zip-top bag. With bag zipped closed, crush candies well with a rolling pin or hammer. (Larger pieces of candies won’t adhere well to the rims.) Place finely crushed candies on a small plate. On another small plate, place 1/4 cup of thick caramel sauce or frosting. Over medium heat, combine apple cider, caramel sauce, heavy cream and cinnamon. Whisk while reducing heat to a drinkable temperature (do not boil). Remove from heat and whisk rum into the mixture, making sure the cinnamon is thoroughly combined and not clumpy. Pour cocktails into rimmed room-temperature mugs. Top with whipped cream and a dusting of cinnamon. Serve immediately. Thick frosting can be used instead of the caramel on the rims, and red sugar sprinkles or jimmies can be substituted for the crushed cinnamon candies. The amounts of cream, caramel and spiced rum can be adjusted to taste. Welcome fall with this warm, smooth, adults-only apple sipper. One of the best parts of fall is that it’s finally apple season. And apple season means it’s also apple cider season. 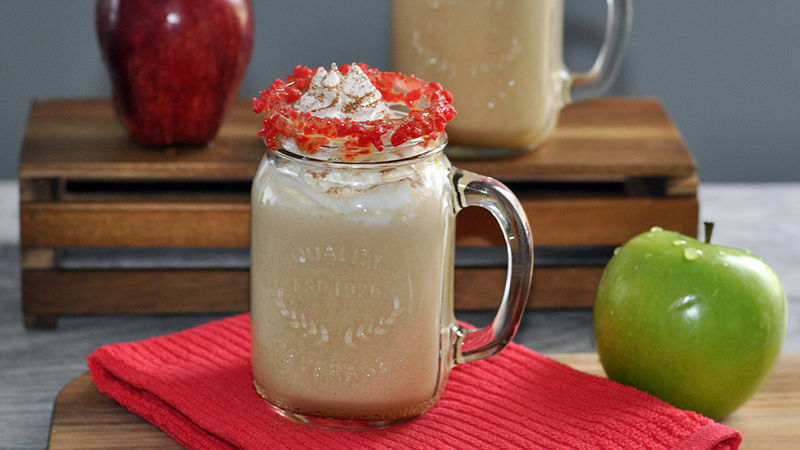 Apple cider season means it’s also… spiked apple cider season! YES! All you need for this cocktail: apple cider, cream, caramel sauce, cinnamon and some stuff with a bit of personality (rum). This smooth sipper is all about pouring fall into your mug. Speaking of mugs, rim yours first with some thick caramel sauce dotted with crushed cinnamon candies. It’s not only pretty, but we’re rolling with a fall flavor theme here, too. Heat up the cider, cream, caramel and cinnamon. That’s a whole lot of c’s… but we’re NOT. DONE. YET. Pour the warm drinks into the rimmed mugs and top with whipped cream and a dusting of cinnamon. Then sit down and feel the snap in the air while you sip one of the season’s premiere palate pleasers. This is fall, after all!